Dogs aren’t really good at sharing. So what do you do if one of your dogs has a bad habit of stealing food from your other dogs? The situation gets even trickier if your dog will growl when you try to take food away. So how do you stop this behavior – safely? 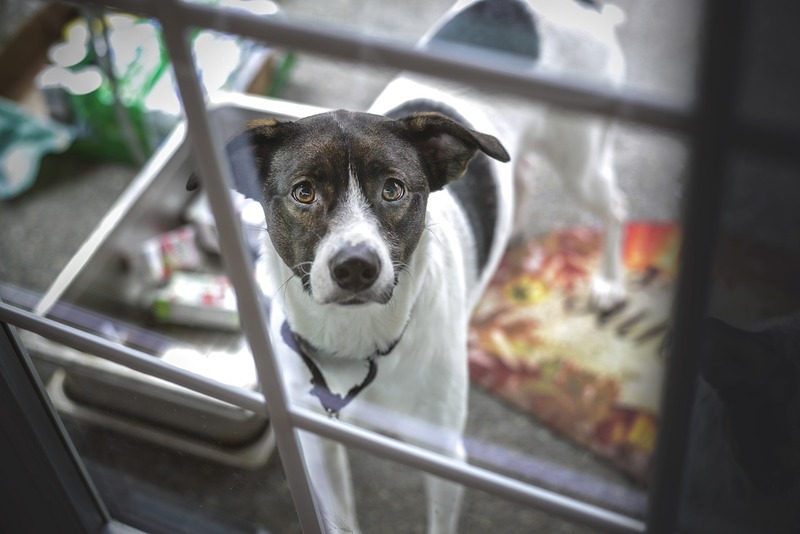 We’ve already talked a bit about resource guarding and food aggression in our articles, “How to Teach a Dog to Share” and “Managing Dog-Dog Food Aggression,” so be sure to check those articles out for more tips! When we give [Fido] food and other dogs food at the same time, [Fido] likes to go to their food and eat it. That is the only time he ever gets aggressive. [Fido] will bark and growl and lunge towards you if you try to take the food. The very first thing I’d suggest if your dog steals food from other dogs is to have the dogs eat separately. You can feed the dogs separately inside of their crates, while tied down on opposite ends of a room, or in different rooms. Fido can’t bother the other dogs while they eat if he’s not anywhere near their bowls! Once the dogs are done eating, you can clean up the bowls and reintroduce them to each other. This also will allow you to avoid bothering your dog while he eats. When your dog steals food from other dogs, you need to come in and police that bad behavior, right? Unfortunately, that means you are bothering your dog while he eats (the stolen food). This can lead to resource aggression towards you. Resource aggression is usually defensive – the dog is scared that you’re going to take something away! A key component of good resource guarding training is to avoid having to take something away from your dogs. Again, this means feeding the dogs separately so your dog is never able to steal from another dog again! Now that your dogs are happily eating separately, you probably are seeing a large decrease in aggression. You can just leave your training here, if you’d like. But if you want to teach your dog not to be aggressive around his food, you’ve got to do more than prevent the problem! This is where counterconditioning comes in. Basically, you’re going to start teaching your dog that you approaching his food is actually a good thing. 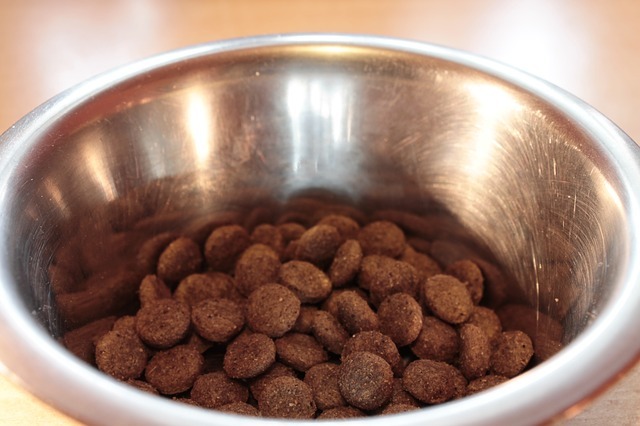 Right now, your dog thinks that letting you come near his food bowl is a bad idea. He’s worried you’re going to take it away! This is why the old advice of messing with your dog’s food to prevent resource guarding actually often backfires! Instead, give your dog his food inside of a puzzle toy or slow feeder. Now, approach your dog while he’s eating. Don’t come too close! We don’t want to threaten him. The distance that you start at will depend on your dog. It might be 6 inches, it might be 16 feet. Now toss something tasty to your dog – a piece of boiled chicken breast or some cubed cheese. Pretty quickly, your dog will learn that you approaching him while he’s eating means he’s about to get dessert! Once you see him lifting his head and wagging his tail in anticipation of your dessert, you can move closer and closer. If you’d like, you can start adding a cue to this (like “drop it”) so that you teach your dog a cue for dropping what he’s got and coming to you for a treat. Pretty soon, you’ll be able to take your dog’s food away in exchange for a tasty treat (of course, you probably shouldn’t take your dog’s food away regularly – that isn’t very nice). You’ll be able to use this trained response to get your dog to politely give up other things, too – like gross pigeon wings on the sidewalk. This counterconditioning protocol can take a while. If you’re getting stuck or seeing regression, odds are you’re asking too much too quickly. You can always sign up for one of our private online training sessions to get extra help – an expert eye can really help when digging into these issues.